Windermere, anciently known as Winandermere, is the largest of the Cumbrian lakes. (I say Cumbrian, but until county boundary changes in the 1970s most of its banks were in now-much-reduced Lancashire and the rest in now-vanished Westmorland). Windermere and Coniston Water were the two major “Lancashire Lakes”. At ten miles long and reaching a maximum of a mile wide it is England’s largest lake, a ribbon of water carved out by glaciers which left two deep basins joined by a stretch of shallower water where there are several small islands. The northern basin, with its 220 ft. of water, makes it the second deepest lake in England after Wastwater. Fifteen thousand years the two deep areas were on opposite sides of a range of low hills. The last ice age resulted in a gap beeing created in the hills and the two separate small lakes being joined together by the stretch of shallower water between, and so forming the ten mile ribbon of water that we have today. (See my 2008 blog post on this, Windermere and the Ice Age). Windermere village is not at the water’s edge but on the hillside about two thirds of the way up the eastern shore. Nearer the water is Bowness-on-Windermere. Nowadays it is pretty well impossible for the visitor to see where one finishes and the other starts as they have effectively combined to create a small town with a wide range of shops, hotels and restaurants. There is no major centre on the western shore. From Newby Bridge and Lakeside at the southern end to the point below Far Sawrey where the ferry crosses the lake there are large houses on the hillside built mostly by wealthy industrialists in the nineteenth century, but no lakeside communities. From there northwards there is no road close to the water; the road goes over the hill to Hawkshead before turning back toward Windermere to reach it again at the head of the lake. However, the Windermere Way walking route does follow the lake shore for part of this stretch. Ambleside is at the north of the lake, slightly to the eastern side, and along with Bowness is Windermere’s contribution to the Lake District mass tourism honeypot. The lover of rural peace and quiet will use these for their facilities and quickly leave for quieter parts. However, as a child I loved to go out on a rowing boat from these centres, and to sail on the ‘steamers’. My own children when young certainly far preferred Bowness to Buttermere. These days there is also a good variety of indoor visitor attractions. These were greatly needed both to cater for periods of wet weather and also to extend the visitor season and make local tourism business more viable around the year. Windermere is a beautiful lake in all seasons. In the nineteenth century it became the place for the super-rich of the day to build their country homes, and sail their expensive yachts, some of which have in recent years been recovered from the bottom of the lake – although how they all got there is something of a mystery. Long centuries before that it was a commercial thoroughfare with barges and small boats moving supplies and produce in and out of the hill country. Even in the eighteenth century, before its discovery by the Lake poets, this part of the Lake District had become a place to which those who could afford it would retreat from the pressures of political or business life. William Hague in his recent biography of the great Christian anti-slavery campaigner William Wilberforce writes of his time of convalescence at Rayrigg Hall, near Windermere, which he rented for several years but eventually gave up because the house that was intended as his rural retreat was attracting too many visiting friends, and even socially demanding distant acquaintances, friends of friends, so that he was unable to concentrate on refreshing himself with the period of reading and prayer that he’d planned. With little doubt this magnificent lake will continue to attract visitors as long as humans populate this country, and as in the past achieving a balance between popularity, accessibility and retreat will be a constant challenge both for individuals and the wider community. Especially given present day concerns about the environment it is vital that the physics, chemistry and biology of freshwater habitats are thoroughly researched and understood. 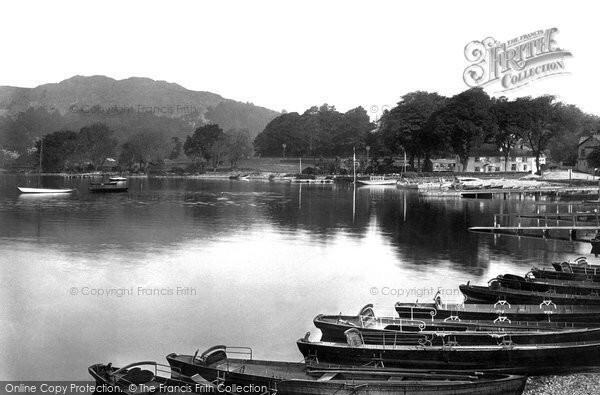 It is therefore good news that the facilities of the Freshwater Biological Association (a registered charity) have been located by ferry terminal on the west shore of Windermere since 1929. This is a world-class research organisation in its field, and is probably one of the major reasons why Windermere is one of the most extensively studied bodies of fresh water. Personally, delighted as I am at the great work they’ve done down the years, as one who has passed the laboratory buildings and gazed at them longingly for more than fifty years (ever since being fascinated by freshwater ecology while studying A-level biology at Burnley Grammar School in the fifties) my one regret is that as far as I’m aware it has never had a visitor centre. 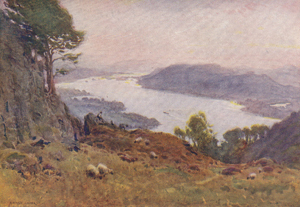 Windermere does of course feature prominently in general books about the Lake District, and that is as it should be. For a book specifically about this lake and its environs I can do no better than to recommend one from about twenty-five years ago, but still fairly easy to find: Portrait of Windermere by Christopher D. Taylor. This excellent book describes the landscape, its geological origins, its history and development from earliest records to the late-twentieth century. If you want to be well-informed about Windermere, read this book. It is now out of print but still widely available from book dealers. Click on the graphic or on the title above to find a copy to order on-line. For a book about the lake district more generally, and from the same series, I can also recommend Portrait of the Lakes by Norman Nicholson, the poet from Millom and prolific writer about Lakeland. As the blurb on the dustjacket says, “An alternative title to this book might well have been Lakes Alive, for it is essentially about a living landscape and the men and women who live in it.” As with the previous book it is not a recent publication but its contents are timeless.